12.3-megapixel DX-format CMOS sensor: Nikon's exclusive digital image processing system advances DX-format image quality to new levels. Continuous shooting from 6 frames per second up to 8 frames per second*: The new optional MB-D10 multi-power battery pack makes the D300 a powerful performer for a wide variety of shooting disciplines. * When using the EH-5a AC adaptor or the MB-D10 multi-power battery pack with batteries other than rechargeable Li-ion En El3e. Fast, accurate 51-point auto focus with 3D focus tracking and three dynamic AF modes: Exacting auto focus precision at blazing speeds! Nikon's exclusive EXPEED Image Processing Concept: The foundation of Nikon’s newest Image Processing Systems, EXPEED culminates the concepts, innovations and years of Nikon’s digital image processing technologies at blazing processing speeds. Dynamic integrated dust reduction system: Self-cleaning ultrasonic sensor unit minimizes degradation of image quality due to dust particles. New Picture Control settings: Advanced color control with 4 preset options; standard, neutral, vivid and monochrome, as well as 9 customizable settings. 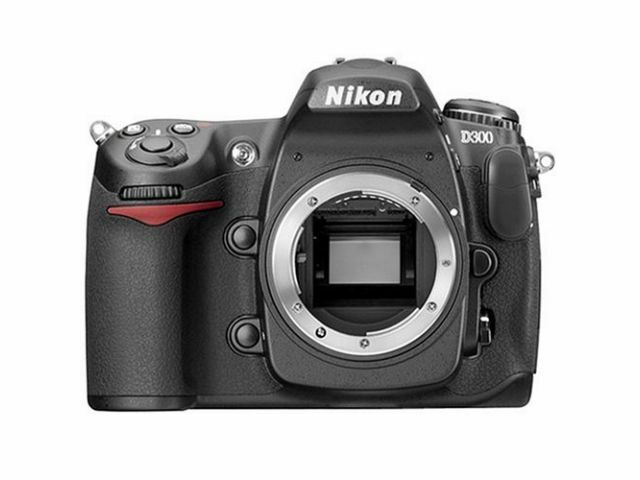 Rugged magnesium-alloy construction: Along with advanced dust and moisture protection and a durable shutter mechanism: The D300 has been tested to 150,000 cycles making it the perfect choice for photographers who demand high performance and agility. The 3.0-inch super density 921,000-dot VGA color monitor: 170-degree, wide-angle viewing and tempered-glass protection makes critical image review possible. 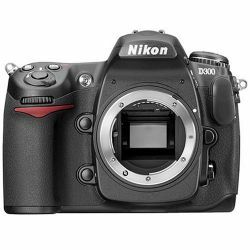 Low-noise files at ISO from 200-3200; The D300's DX-format CMOS sensor, with a high signal-to-noise ratio, empowers photographers to produce exceptionally clean files from a broad 200-3200 ISO range. Expanded range of options include Lo-1(ISO 100 equivalent) and Hi-1(ISO 6400 equivalent). Nikon's exclusive Scene Recognition System (SRS): The improved 1,005-pixel 3D Color Matrix Metering II provides even more intelligent auto exposure capabilities, along with smarter auto white balance detection and faster, more accurate AF performance. Selectable 12-Bit or 14-Bit A/D Conversion: The choice of selecting bit-depths at 12-bit (4,096 tones) or 14-bit (16,384 tones), both yielding incredible image quality through a full 16-bit processing pipeline, enables photographers to choose smaller files at faster operating speeds, as opposed to larger files with smoother tonal gradations at slower operating speeds. Two Live View shooting modes: Use either hand-held or tripod when shooting in a studio, remote situations or from challenging angles. Nikon's Active D-Lighting Image enhancement: Provided on the fly while shooting, Active D-lighting produces broader tone reproduction in both shadows and highlights by controlling light intensity and exposure compensation while applying localized tone control technology to achieve the right level of contrast across the entire image for sharp, detailed results.